Featuring a space saving design the Marlborough Bi Fold Driveway Gates require minimal space to open and close making them perfect for short driveways or restricted parking spaces. Marlborough Bi Folding Metal Driveway Gates are handmade in the UK using high grade steel components to ensure strength and durability and prove very popular with homeowner working to limited space constraints. 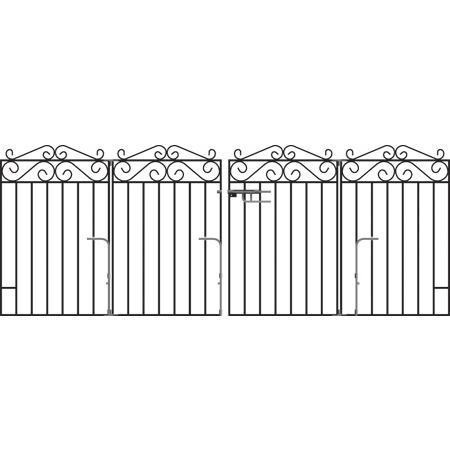 Featuring a space saving bi fold design the gates require only half the swinging radius of a standard 50/50 split configuration and as such are our preferred choice for properties with sloping driveways or restricted parking access. Choose from a selection of standard sizes online to suit common openings up to 12ft in width or get in touch today if you need a made to measure size. Allows for pedestrian access within the design. Decorative wrought iron style scrolls create a traditional design appeal that will not date or go out of fashion. Black primer/undercoat (you will need to paint all surfaces with at least 2 coats of exterior grade paint prior to installation). 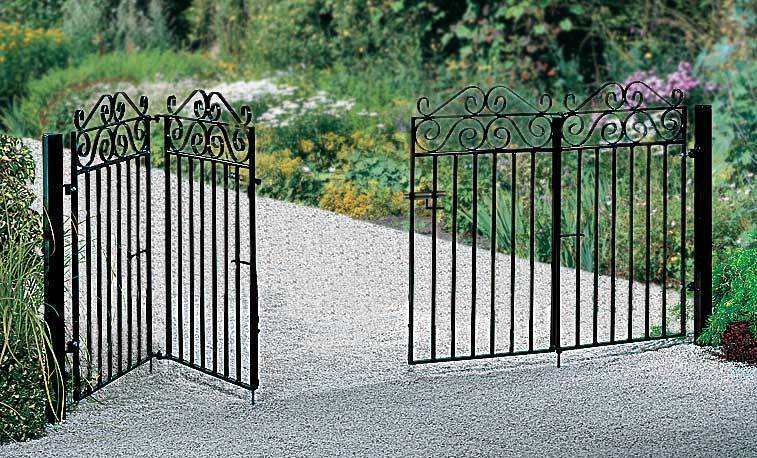 Confused about Bi Folding Driveway Gates? For more information about these simple yet effective double gates or would like help choosing the correct size please get in touch by phone or email or refer to our case studies page to see past customer projects. For online guidance we have compiled lots of helpful pages including our problems and solutions page, measuring guide and installation advice page. Other popular topics we have covered online can be found by clicking the links detailed below. To help complete your installation or if you are looking for a non-standard finish we are pleased to be able to offer you the following optional extras. To find out prices or to discuss you options please call us on 0844 804 5577, email sales@gardengatesdirect.co.uk or fill in our enquiry form.